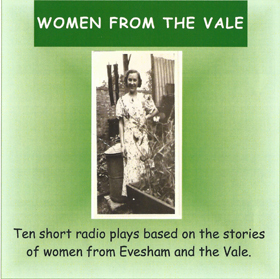 In this project, I recorded 25 interviews with local women about their experiences of growing up in the Vale of Evesham during the 1940s and 50s. I also worked with students at Evesham High School who created a short mime based on one story which was performed to an invited audience in Evesham library. The oral history interviews were also used to create 10 short radio plays, which were professionally directed and recorded at BBC studios. The cast consisted of members of the community aged between 7 and 70. The archive is now at The Hive in Worcester. Click on the play button to listen to ‘On the Land’, a 5-minute radio play based on oral histories from ‘Women from the Vale’ and recorded by a community cast. This was a community project run by the Droitwich Spa Older People’s Forum. Residents were invited to a series of memory-collecting coffee mornings in Droitwich library. The group collected more than 30 oral history interviews and a large number of photos, documents and artefacts. These are now available to the public in Droitwich Library. Julia also worked with Witton middle school in Droitwich. The children did some interviewing and produced a Remembrance Day display complete with audio post for the library. Click on the play button to listen to WW2 Spitfire pilot Brian Harris, recorded by Julia for the ‘Our War’ project in Droitwich. 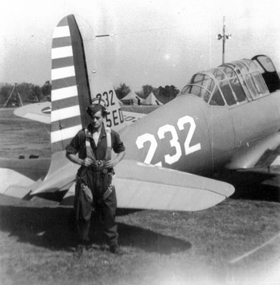 In this extract Brian explains what happened when his engine caught fire at 20,000 feet. 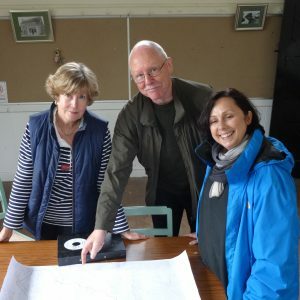 This is a small part of a large-scale natural and cultural heritage project along the Severn Estuary, funded by the HLF Landscape Partnership Scheme and run by South Gloucestershire Council. The project was called A Forgotten Landscape (link to website) and my part in it was to set up, train and mentor a team of volunteers to collect and share oral histories with people who have lived and worked in the area. The volunteers, who had never done any oral history recording before, have collected nearly 40 interviews with a diverse range of people, from traditional Severn fishermen to community workers in Lawrence Weston. Click here to listen to volunteers talking about their experiences of becoming involved in Tales of the Vale and recording their first oral history interviews. Click here to listen to experiences of patients, their families and doctors, recorded for St Richard’s Voices. This school’s 2010 annual school production was a play based on oral history interviews with local people. The students conducted some of the interviews as well as performing in the play, alongside members of the community. The 60-strong cast ranged in age from 7 to 89. 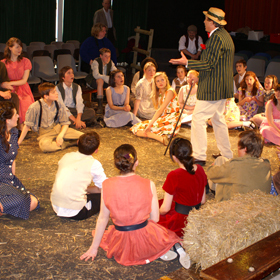 The play, a sell-out over 6 nights, was filmed and the DVD distributed locally. Pupils were also involved in creating a CD of music and memories, an art display, and a 1940s May Day Fair. Click on the play button to listen to extracts on hop growing and hop picking taken from oral history interviews recorded by Julia for the Harvesting the Past Project. This was a small-scale project to engage children from traveller backgrounds. After two training sessions, the students interviewed relatives and friends who had grown up in wagons. After visiting the local museum which has a fine collection of wagons, the children wrote short scripts encompassing extracts from their interviews. These were loaded on to Audio Guides and used in the wagon shed at a celebration weekend of gypsy culture at the museum. 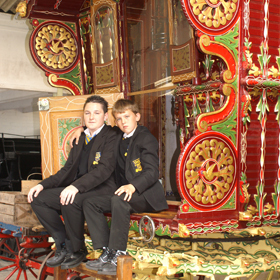 Click on the play button to listen to an audio track created for an exhibition in the wagon shed at the Worcestershire County Museum at Hartlebury by students with traveller backgrounds from Stourport High School. In this track, the students have interviewed Tana Smith about living in the Romany Maid when she was growing up. A project funded by HLF’s WW1 grant involving four Worcestershire first schools, Hindlip, Tibberton, Ombersley and Wychbold and led by Droitwich Spa Library and supported by the University of Worcester. Working with Year 3 and 4 teachers from the four schools, I organised workshops and training in all the school and trips to Smite Farm (Worcestershire Wildlife Trust’s HQ) and Droitwich Spa Library. The aim of the project was to discover what it was like to be a child in the Droitwich area a hundred years ago. We used school log books, census records, old photos, farm records, artefacts and documents to find out how children lived and what they did to help with the war effort. Our research led to the discovery that children had time off school in September and October in 1917/18 to pick blackberries for jam-making which provided troops with a good source of vitamin C. Each school designed their own project, some over 2 weeks and some over a whole term. The projects involved every aspect of the curriculum from maths, science and literacy, to drama, art, music and dance. All the schools made jam and contributed displays for Droitwich library and a conference on The Home Front during WW1 at Avoncroft Museum. See project website. 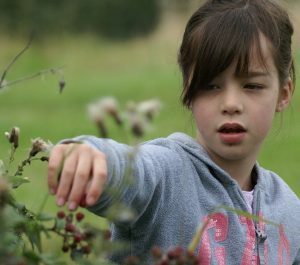 Click on the button to listen to a radio broadcast made by the children and Broadcast on BBC Hereford and Worcester about the Great Blackberry Pick. 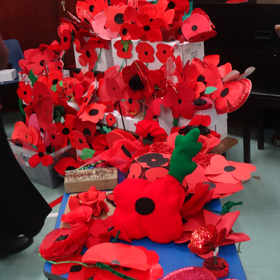 This was a themed day in a Worcestershire primary school to commemorate the centenary of the Battle of Gheluvelt. I worked with actor and children’s author John Townsend to create a variety of interactive and creative activities which gave the students an idea of what it was like to be a child in 1914. We started with a re-enactment of a 1914 assembly (with staff and students in costume) in which we challenged the school to put on a patriotic fair by the end of the day to raise money and morale. The children worked in groups making cards and penny flags for the fair, recording interviews with a munitions worker, deciphering secret codes in letters to troops, rehearsing a specially-written play and handling real WW1 artefacts. After the fair in which they sang, performed and sold their creations, there was a poignant Act of Remembrance when each Year 5 and 6 child laid a poppy for each soldier killed at Gheluvelt. Head teacher Jim Turner said it was the best themed day he could remember as the children got so much out of it.